The tips inbox was inundated with great tips this past week (like always!) 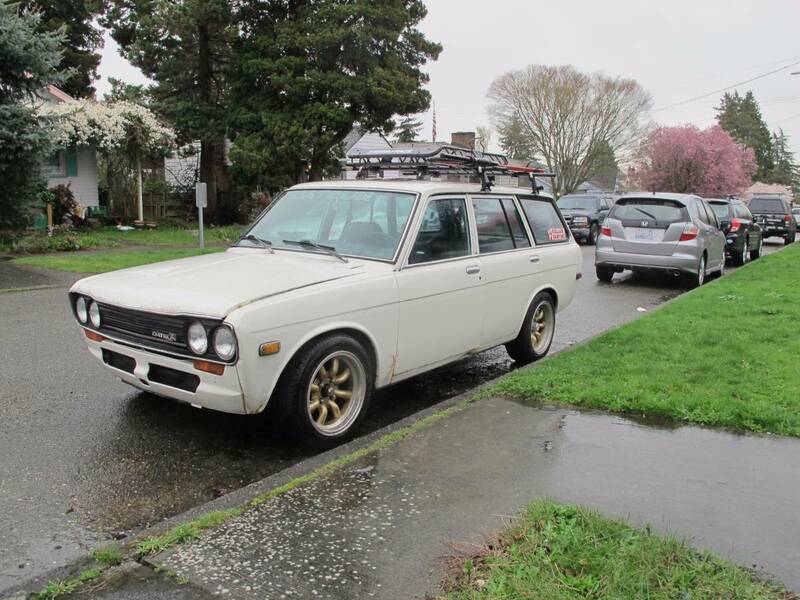 and tipper FuelTruck delivered a fabulous load of Datsun 510 Wagons -- time to pick your favorite one. The three examples come in three different colors...mucus, pus, and bile. 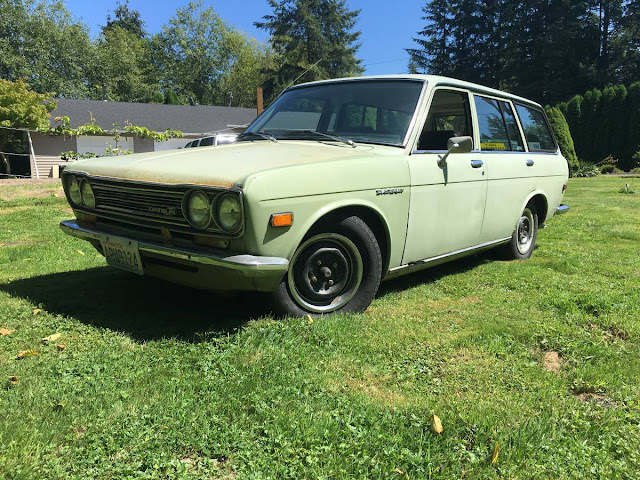 Up first is this lovely mucus green 1972 Datsun 510 Wagon offered for $4,200 in Monroe, WA via craigslist. The car has been sitting for a long time, but its got a "damn cam" and 219 SS heads + dual carbs. It needs some TLC, but it is nothing some elbow grease and mucinex can't cure. The next model is a 1971 Datsun 510 Wagon (also in the greater Seattle area) sporting minilite wheels and a dirty shade of pus colored paint. Hope that the infection goes away because this car runs/drives really well and "pulls wells to 75 mph" (is that a good thing...?) but it runs hot and can overheat trying to push 70+ mph on the highway, which is the last place a car should ever overheat unless you are pulling a trailer up a hill...check the cooling system to see what's going on. Last, but not least, is this 1972 Datsun 510 Wagon with some awesome wheels and covered in a marvelous shade of bile green. The car does have some surface rust, but the floors are solid and the engine rules like a well tuned gallbladder. 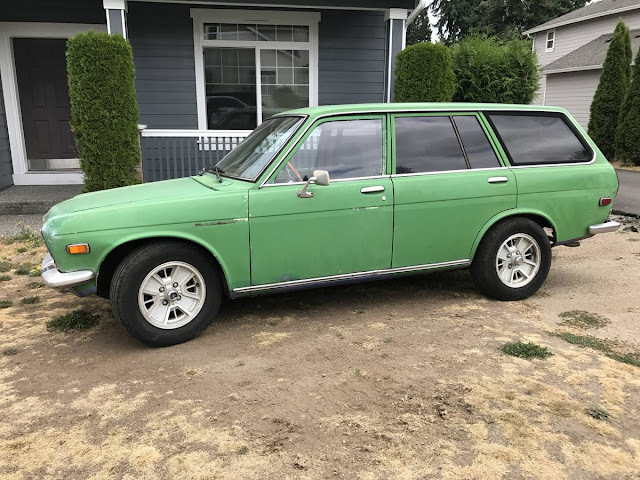 My roommate had one of these wagons and I had a Volvo 220 wagon. Was fun comparing the two. Both can hold a lot, easy to work on, both are good looking cars. I preferred mine and he his. As for the overheating, buy the car for cheap and do a step by step analysis to find the problem. If it overheats while moving then most likely the radiator is the problem. These are up there with the volvo for running forever if the rust has not gotten too bad. If you read the writeup on the 71, it has a lot of owner modifications that sound a little jinky. Reduced to $5200. I'm partial to the bile green one.